App Builder Appy Pie: Cybersecurity and data security have emerged as the hot topics and quite a cause for concern. Industry bigwigs and the small or medium businesses, everyone is equally concerned about the issue. It is a common misconception that it is only the bigger companies with a huge network of computers and an even greater number of people working with them, are the common and major targets for hackers with a malintent. This, however, is quite far from truth. It is in fact the small businesses that fall prey to and are impacted the most by cyberattacks and breaches. 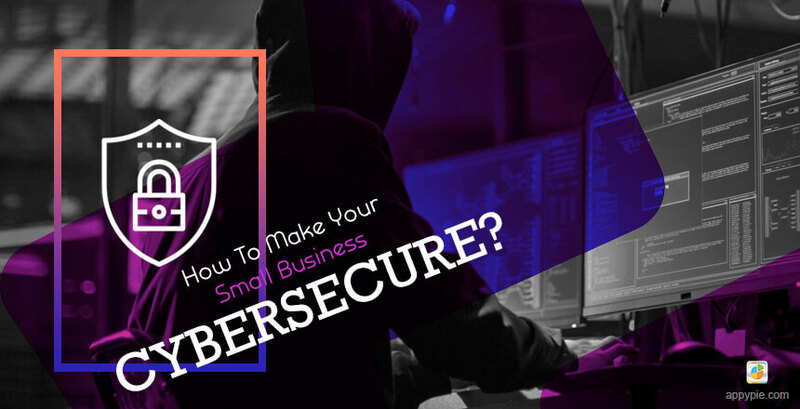 In this post we are going to discuss some of the most efficient strategies that can help a small business make themselves cybersecure. Now, when it comes to the companies that are a little bigger in size, there are quite a few reasons why the hackers would refrain from targeting them. The major reason though is that they are in a better position to invest heavily in cybersecurity and keep their systems and networks protected from the hackers. One of the more surprising findings however is that a good number of small businesses pay hardly any attention to their cybersecurity measures. This is probably why they often end up as unwitting targets to hackers with malintent. It is important for you as a small business owner to understand, therefore, that if you have not put a string cybersecurity strategy in place, you are definitely a soft target. We, at Appy Pie have put together 11 brilliant cybersecurity tips for small businesses to implement and benefit from. Let’s dig in! There is a reason why this is Tip Number One for you! If your organization does not have a clearly drafted and documented cybersecurity policy in place, it is impossible to get everyone on the same page while aligning with the company’s vision. Hence, no mater how small a business you own, if you have employees, you must ensure that there are clear IT or Cybersecurity Best Practices in place which are mandatory for all employees. It is important that the policy clearly instructs everyone including the owner up to the junior most employee to adhere to the best practices stated in the policy and be answerable in the event of non-adherence. There are some areas that can be used to implement it, like structured training sessions which can be held for all the stakeholders involved. Even after setting a clear policy on cybersecurity in your organization, it is important that you put in place a system which would make sure that each of the employees irrespective of their level or position in the organization adheres to the procedures and practices. To begin with, you would have to provide individual logins with independent passwords for every employee using the system. You must make sure that every person who is a member of your staff and handles the system in the office must be aware of the right way to handle computers or any such connected device, they should know to avoid clicking on ads and opening suspicious mails, or even clicking on any unknown links or download any unwanted attachments received on the mail. In case your business requires you to generate any data or store it, it is wise to offer only a limited number of people any access to it, instead of making it free access to all. One great way to formulate policies, document them without missing out on anything, and even organize training sessions is to visit the Small Business Administration or SBA’s cybersecurity portal which offers online training sessions, gives you checklists, and relevant, updated information that is specifically for the protection of online businesses. Another great resource to get you started on your security documentation is the Financial Communications Commission’s Cyberplanner. A firewall is the first line of defense in the event of a cyber-attack, which is why it is one of the most critical aspects of cybersecurity for any business. The modern-day computer systems have a built in firewall that are designed specifically to protect it against any probably or possible malware attack. Make sure that this is turned on. This is hard to miss, especially because the system would keep prompting you if the firewall has been turned off for any reason at all. Do not ignore this prompt and quickly turn the firewall back on! 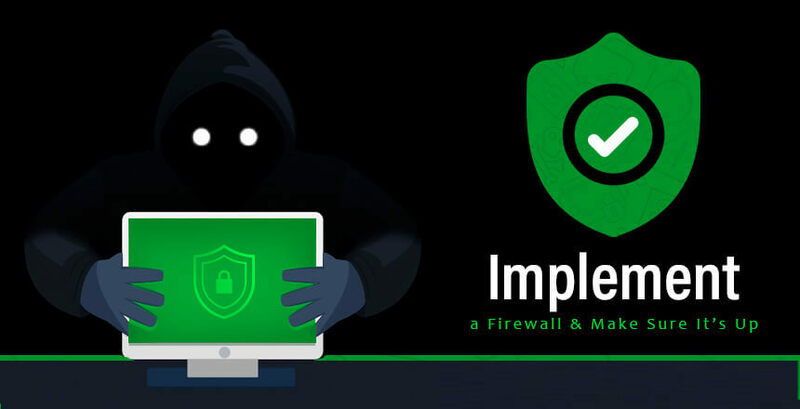 In addition to this, you can consider getting some external firewalls which would ensure that there is an extra level of security added between your computer system or your server and the supply point of your internet service provider. In case you are taking work home, you must ensure that you put up suitable firewalls even at your place of residence. It is quite a common practice, especially among the small businesses to hire people temporarily, maybe for a project or a certain task, or even on an hourly basis. Though this might be logical for a number of reasons, but it also means that the number of people handling your systems is huge with new people coming in all the time and using the computers for a variety of tasks. Hence, it is important that every person on the staff, whether they are regular employees or are going to spend only a few days in your organization, must be completely aware of the risks and threats in context of cybersecurity and exercise caution while handling the computers or connected devices. One wrong click on a malicious link or attachment or even an ad can cause everything that you have worked for, so far to collapse in a fraction of a second. The damage could be in terms of the business or any clients’ data that you may have stored in your system or any other critical information pertaining to your business. Make it a practice to induct all the new recruits with a session where they would be trained about cybersecurity protocol and policy in place in your organization. 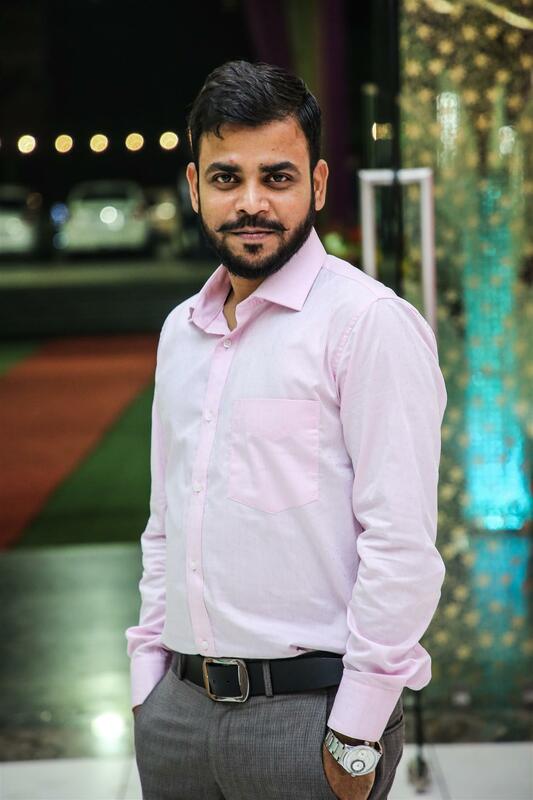 It is inly after the person has completely understood everything about the best practices and protocol regarding cybersecurity, that they should be able to handle any computer systems or connected devices at the offices independently. While it is important and quite effective to implement any kind of preventive measures especially by employing the cybersecurity policy and ensuring its implementation, it is wise to be prepared for the worst-case scenario. Make sure that you back up your data frequently and regularly wither on the cloud, or on any external storage from where it can be retrieved in future, as needed. This means even if you encounter a breach of some files on your system, you can stay calm with the knowledge that you have a back up elsewhere. This is something that needs to be a pretty disciplined act and must be assigned to one person in particular. Answerability will ensure that the task is accomplished as needed, at regular intervals. All kinds of business data and any other information must be stored or backed up to a specific centralized system, which can have extra layers of security established in it to make it safer. This is almost a given, a tip that you absolutely must not ignore. 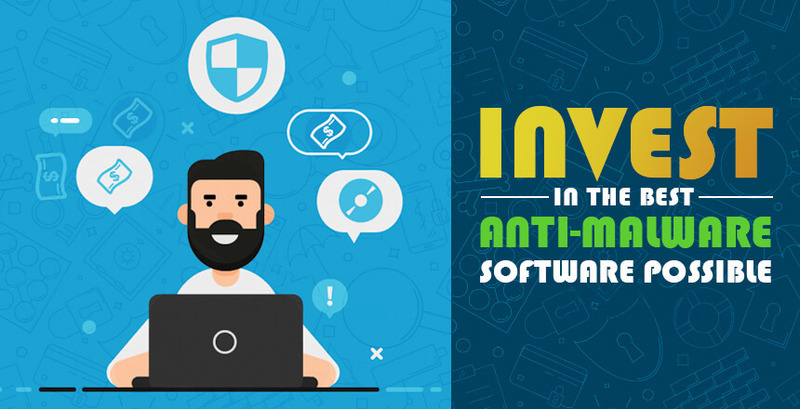 Even non-business or individual entities have realized the importance of a good anti-malware software in order to safeguard their data. In such an environment where vulnerability to cyber attacks are paramount, the importance of getting only the best anti-malware software cannot possibly be stressed enough upon! The market is flooded with options in this context with a huge range of quality software. Explore the different options available, go through the user reviews that have been posted online. It is important that you get only the best anti-malware for your place of business even if you need to pay for it. However only getting the software and installing it is not enough. You must pay attention to any updates that are being issued by the program developers. This part is of special importance because hackers are continuously developing new malware content and new ways to launch a cyberattack and your anti-malware program would have to step their game up and be able to stop these attacks. The only way to make sure that this happens is by keeping your anti-malware software updated! According to the experts in the industry, if any small business is looking for ways to strengthen their cybersecurity measures, they must include multifactor authentication that goes beyond a mere password when they are accessing their systems. One way to do this is adding the mobile number of the staff member as an extra layer of security. This however would only work in cases where we are sure that hackers would not be able to get their hands on both the passcodes. This addition has proven to be successful in making the cybersecurity systems more robust. In this case, however, it is important to immediately withdraw any kind of access or permission associated with the mobile number of the employee as they leave the organization. This is irrespective of the terms of separation, amiable or not so amiable. Organizations that have failed to do this have often discovered that they former employees actually stole a whole lot of critical data after leaving the organization. For small organizations, this is a specially critical detail which mustn’t be ignored. More and more people are opting to use connected devices like smartphones and smartwatches even for activities related to their business or place of work. As you are drawing up the holistic security plan, make sure that you consider such devices and add them to the whole loop you are forging. Make sure that the same yardsticks are applied on these devices specially when it comes to authentication and access. In addition to this, you must also consider the fact that you may at one time (sooner than you think) adopt Bring Your Own Device or BYOD policy where most of your employees would be choosing to work on their own devices including laptops, tabs, smartphones and even smartwatches or other wearables. This is why it is important that during documentation you add a section pertaining to BYOD with clear cybersecurity policies. In addition to this, you must make sure that your employees set up automatic security updates and that the password policy is implemented on all the devices with access to the system or connected to the server. Surprise checks or random inspections are known to expose critical vulnerabilities in time for correction and before any serious damage has been inflicted. The idea here is to deliberately let a virus into the systems and let the staff members trace and remove it in time. This can be done in two ways. This simulated audit may be conducted either by a system engineer within your organization, or you can hire an external expert to do it. Though the process in both the cases will be exactly the same, but the results are bound to vary widely. This is majorly because a professional is more likely to do a more thorough job while offering a comprehensive report on critical issues while bringing you up to date on the preparedness of your organization with respect to any cyber threats that you may encounter at a given moment. We have talked earlier about implementing anti-malware software, but in case you are looking for something more then you can consider one of the more specialized services that are on offer for small or medium sized businesses. However, it is a good idea to dig deep into the different options in front of you, study them in detail to understand which features are the best suited to what you are looking for. You can even try out various trial versions for different services so that you are better equipped to take the final decision. No one wants to change their passwords as the process is generally long winded and a disruption to the regular flow of work. But it would put things in perspective if we were to talk about the Verizon 2016 Data Breach Investigations Report. This report established that 63% of the data breaches only happen because of passwords that were too weak, or lost, or stolen. Not only should the employees be mandated to change their passwords regularly and often, but also be made aware of safe password practices. To begin with, encourage your employees to use a combination of upper-lower case characters of the alphabet, numbers, and symbols. Also, release a mandate for all the employees to change their passwords in every 60 or 90 days.